The RAK Series 600 Wrap Over Urea Toilet Seat is a high-quality loo seat that fits perfectly with a RAK Series 600 pan. 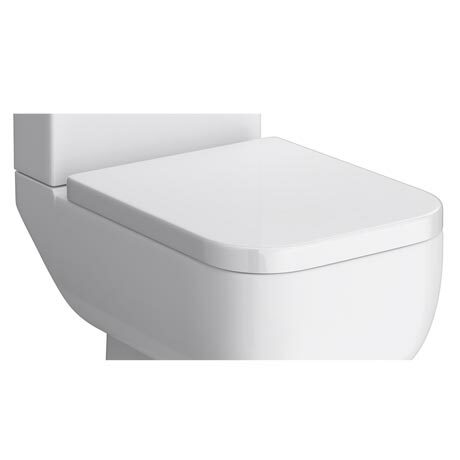 RAK products are renowned for their quality and this toilet seat is no exception. Hello, many thanks for your questions. Some toilets do have the emblem of the manufacturer on them, however, it may be hidden by fixings or the cistern. There is no way to identify otherwise. Please do not hesitate to contact us if you have any further questions regarding our products. Hi Lou, this seat has a standard close. However it is available with a soft close hinge, the code for this is S600SEATSC. If this code is typed in the search bar it will bring this item up for viewing. Thanks! Q. hi does the seat include all hinges etc as my toilet hinges are broken. HI,yes this wrap over seat comes with all hinges and fittings required. Thanks! Hi Craig, no unfortunately that product would not fit. You would need to purchase the following toilet seat, found under product code - SUMSEATSC - I hope this helps! Excellent service, speedy delivery and great range of products. Excellent product and the service was superb. It's a bit pricey for a loo seat but the hinge quality seems good and was very easy to fit. My only problem is the design itself. The pan rim is very narrow so when the seat is down, the pads are only just touching the rim and mostly overhang inside the toilet. A bit more attention to detail would have been better but never mind. This must be the most uncomfortable toilet seat ever.